Come on guys! I know that I might have been poisoned from the get go for this game due to my hatred of the frog commercials that were on TV and the absolute lack of charm of the main character. Add to that the fact that all the Crazy Frog toys still sitting on stores shelves, marked down and still not selling. Put all that to one side and you can then approach the game with something only amounting to distaste for the main character. In case you did not guess, this is a racing game, however its one almost devoid of any charm. There is a world populated by the characters of the Crazy Frog world, however as the whole world is based on a CG character designed to sell ring tones you are immediately left in the cold and I felt that I could not grab onto a character and feel as though it was mine. This is one of those games where you can tell it’s been released in a hurry to tie in with another product promoting the character. The state of play is dodgy at the best of times and the placement of weapons ordinary. 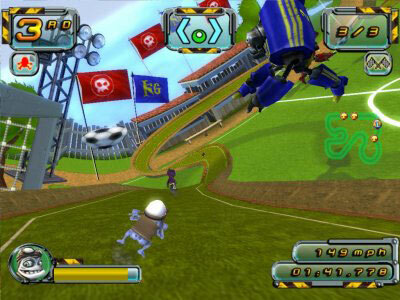 Whilst you have great games like Mario Kart that have been put together perfectly with a great balance of weapons and also arenas to race in, Crazy Frog simply becomes mundane pretty quickly. About the only thing that rises from mediocrity in the game are its graphics, that is not to say that they are good, only that they are not as bad as the rest of the game. 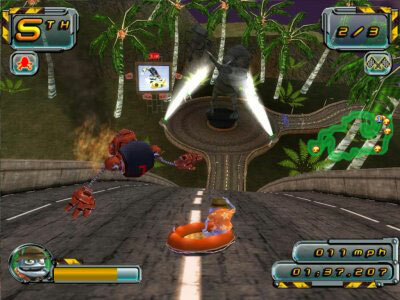 There are a number of mini games and battle modes in the game but they don’t rise above any other stage of the title. This is a game that maybe little kids will play without too much complaint but anyone over the age of about eight will become bored pretty darn quick. Personally, unless you love your ring tones waaaaayyy too much, I’d be giving this a wide berth.